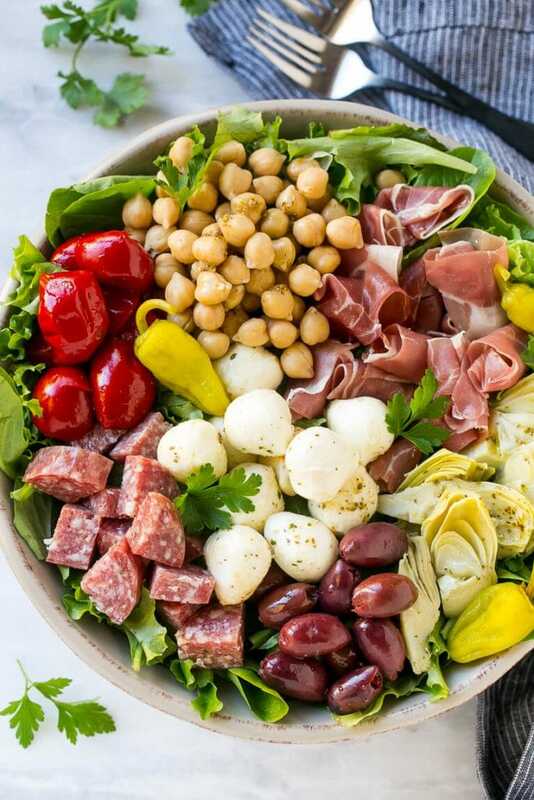 This recipe for antipasto salad is loaded with Italian meats, cheese and veggies, all tossed in a homemade zesty dressing. The perfect appetizer or main course option. I love a hearty salad; some of my favorites include Ahi tuna salad, brussels sprout salad and this simple yet satisfying antipasto salad. To me, there’s not much better than a giant salad, and this antipasto salad definitely fits the bill. This amazing salad is just loaded with meat, cheese, olives, veggies, you name it! Top it off with a homemade Italian style dressing and you’ve got salad perfection. How do you make antipasto salad? 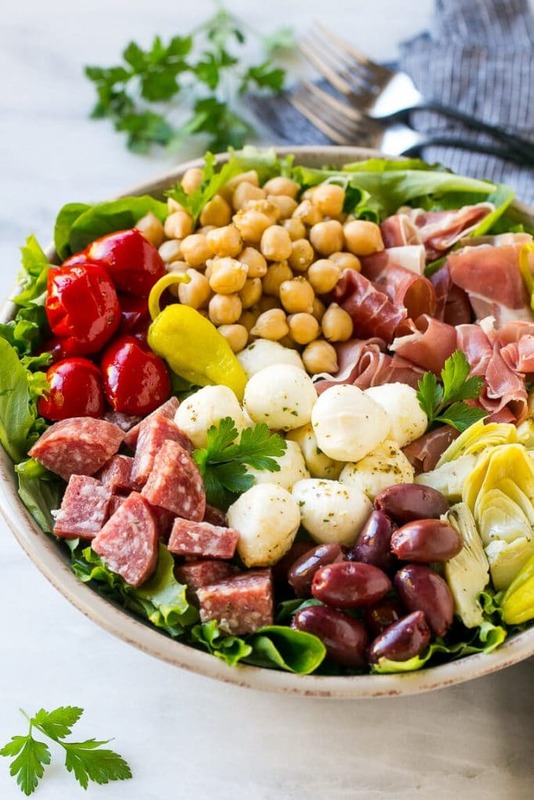 Let’s start by talking about the ingredients – you can really use whatever lettuce you like for this antipasto salad, I tend to just buy one of those bags of pre-washed mixed greens. 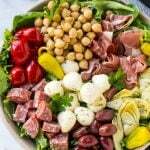 I top this salad with salami, prosciutto, olives, mozzarella balls, artichoke hearts, roasted peppers, chickpeas and pepperoncini peppers. Other great options would be pepperoni, marinated mushrooms, shaved parmesan cheese, roasted veggies like eggplant or asparagus, the list goes on and on! I like to use marinated artichoke hearts and mozzarella balls, it just adds even more flavor to the mix. The dressing for this salad is one of my all-time favorites, I use it for almost everything including my famous Greek chopped salad. The herbs and spices go so well with all of the antipasto flavors, it’s a match made in salad heaven. The dressing can be made up to a week in advance which is great for when you’re trying to plan ahead. 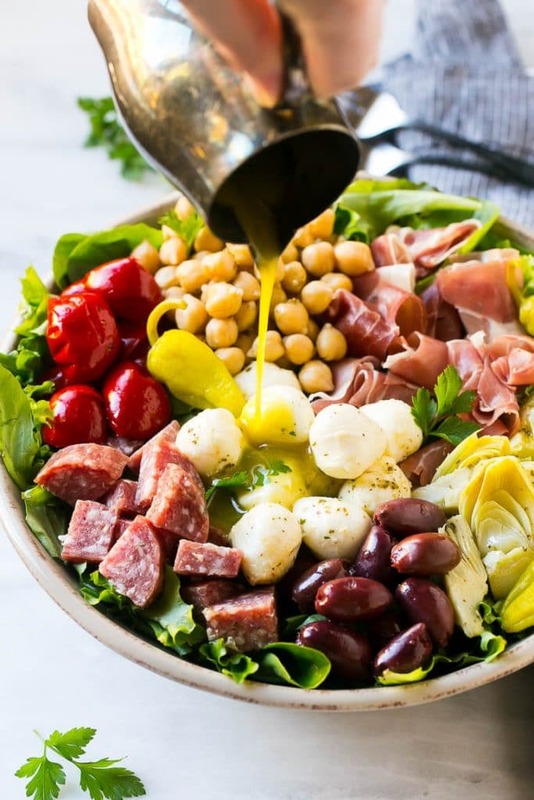 This antipasto salad is perfect for a main course or as a hearty appetizer or side dish. When I serve it as a main course I often have Italian style bread on the side, like focaccia, or even breadsticks! However you serve it, it’s sure to be a hit at a party, as a filling lunch, or for a quick and easy dinner option. 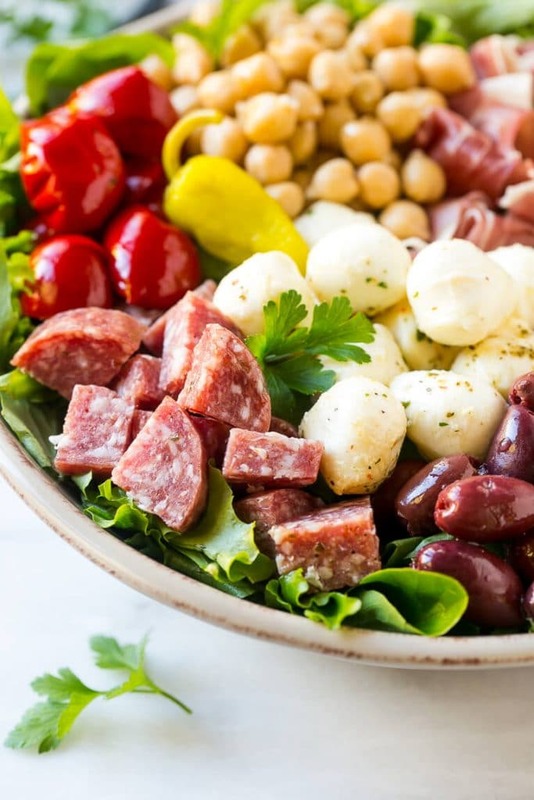 This recipe for antipasto salad is loaded with Italian meats, cheese and veggies, all tossed in a homemade zesty dressing. For the dressing: Place all of the salad dressing ingredients in a jar and shake until thoroughly combined. Set aside. Place the lettuce in a large bowl; toss with half of the dressing. Arrange the meats, cheese, olives, chickpeas and vegetables on top of the greens. Drizzle the remaining dressing over the top and serve, garnished with parsley if desired. I’m having this with crusty sour dough bread for dinner! Very good salad. The dressing Is fabulous! Thank you. Love the salad! It has all my favorite flavors. Yaaaas! Love a good antipasto spread. Love it even more when I can get a little bit of everything all in one bite. The perfect new addition to my lunch rotation!